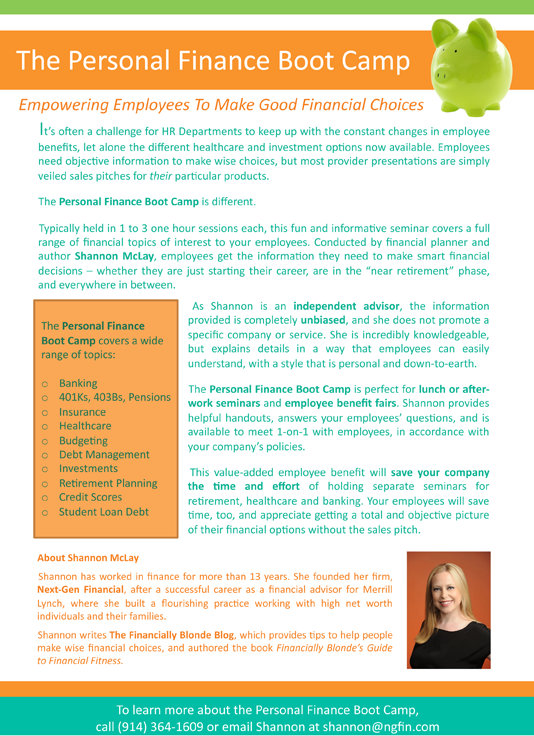 Having written the new website for Next-Gen Financial, a personal finance advisory firm that helps clients become “financially fit” through a choice of membership plans and personal financial trainer sessions, they asked us to develop copy for two e-mail flyers to promote their Personal Finance Boot Camp seminars-one sent to HR personnel for company employees and the other to college administrators for students. Although the audience and topics covered varied for each Boot Camp, the flyers were written in a straightforward but benefits-focused style that reflected the tone of Next-Gen Financial’s founder, a published author herself. It must have worked because because the client booked two Boot Camps in less than a month, and has more in the pipeline.